This paper presents a new algorithm for the joint retrieval of surface reflectance and aerosol properties with continuous variations of the state variables in the solution space. This algorithm, named CISAR (Combined Inversion of Surface and AeRosol), relies on a simple atmospheric vertical structure composed of two layers and an underlying surface. Surface anisotropic reflectance effects are taken into account and radiatively coupled with atmospheric scattering. Coastal waters serve as transport pathways to the ocean for all runoff from terrestrial sources; they are also some of the most biologically productive waters on the planet. Here, we retrieve atmospheric aerosol loading (and properties) from the space-based instrument MISR over all types of water (dark, coastal, etc). 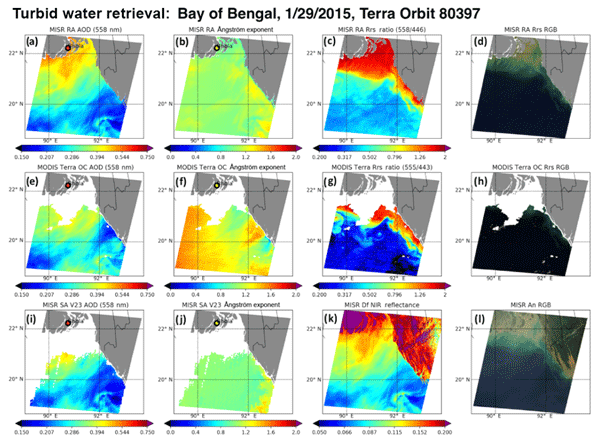 Results from the MISR research aerosol retrieval algorithm agree well with validation, indicating that MISR may add value to commonly used ocean color imagers such as MODIS. We present a methodology to infer the contribution of mineral dust and non-dust aerosol to the absorbing aerosol optical depth (AAOD) of mixed aerosol layers. The method presents an adaptation of a lidar-based aerosol-type separation technique to passive measurements with AERONET sun photometers by using lidar-specific parameters obtained from the AERONET inversion. The findings on BC-related AAOD are compared to CAMS aerosol reanalysis data with promising results for sites in east Asia. 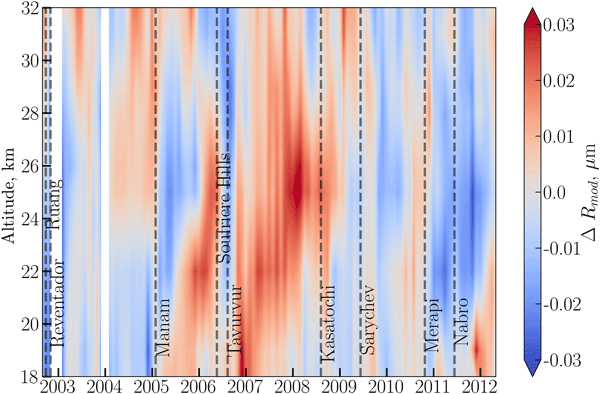 Aerosol type seasonal variability and sources in Siberia are obtained from an automatic 808 nm micropulse lidar. 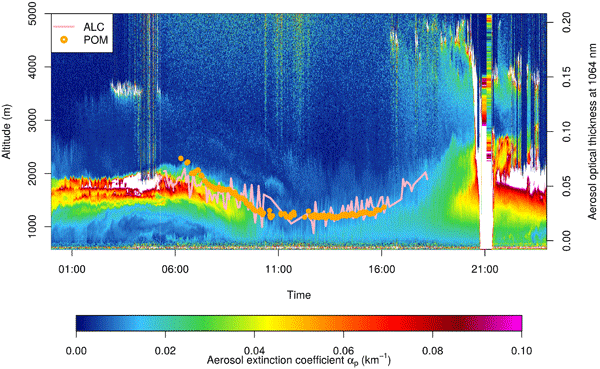 A total of 540 aerosol backscatter vertical profiles have been retrieved using careful lidar calibration. Aerosol optical depth is retrieved using sun-photometer complementary observations and an aerosol source apportionment based on aerosol transport model simulations. Comparisons with satellite observations are discussed for three case studies. Clouds or instrumental anomalies may perturb ground-based solar measurements used to calculate aerosol optical depth (AOD). This study presents a new algorithm of automated near-real-time (NRT) quality controls with improved cloud screening for AERONET AOD measurements. 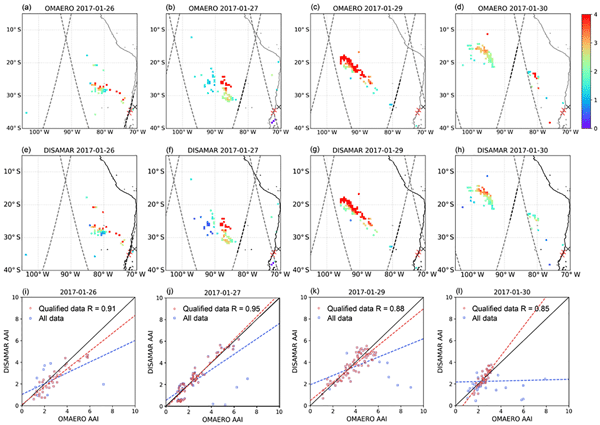 Results from the new and old algorithms have excellent agreement for the highest-quality AOD level, while the new algorithm provides higher-quality NRT AOD for applications such as data assimilation and satellite evaluation. We implement a multimode approach in which each mode has fixed effective radius and effective variance. In this way the algorithm obtains more flexibility in describing the aerosol size distribution and avoids the high nonlinear dependence of the forward model on the aerosol size parameters. The synthetic and real data experiments show that multimode retrievals are good alternatives to the parametric two-mode approach. For the first time, a ground-based N2 Raman lidar sampled smoke plumes originating from a large accidental warehouse fire in the Paris area. We developed a new algorithm, dubbed top-down aerosol optical thickness matching, to characterize the optical properties of the smoke aerosols, without a pre-determined reference zone and in the presence of clouds. The industrial pollution episode was concomitant with the long-range transport of dust aerosols and the presence of an extended stratus cloud. We describe the derivation of an improved aerosol size distribution (ASD) for the OMPS/LP retrieval algorithm. The new ASD uses a gamma function distribution that is derived from CARMA-calculated results. The new ASD also explains the spectral dependence of LP-measured radiances well. 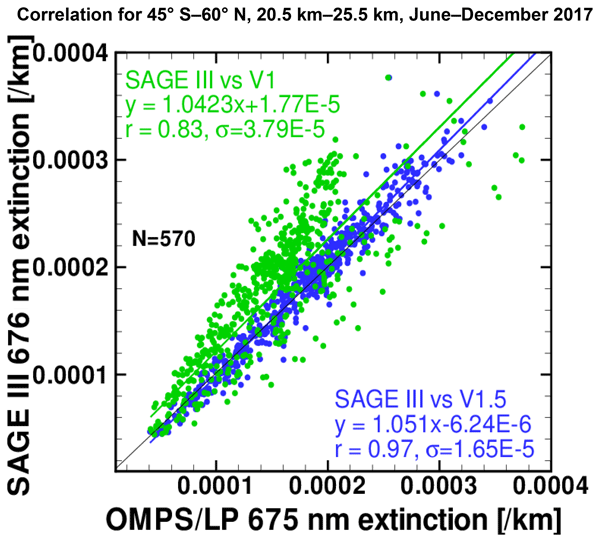 Initial comparisons with collocated extinction profiles retrieved at 676 nm from the SAGE III/ISS instrument show a significant improvement in agreement for the LP retrievals. 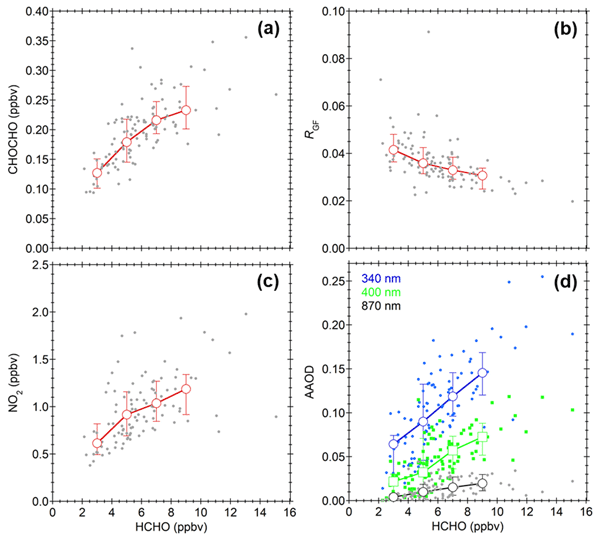 This paper discusses recent advances made in distinguishing among different aerosols species detected in the CALIPSO lidar measurements. A new classification algorithm now classifies four different aerosol types in the stratosphere, and the number of aerosol types recognized in the troposphere has increased from six to seven. 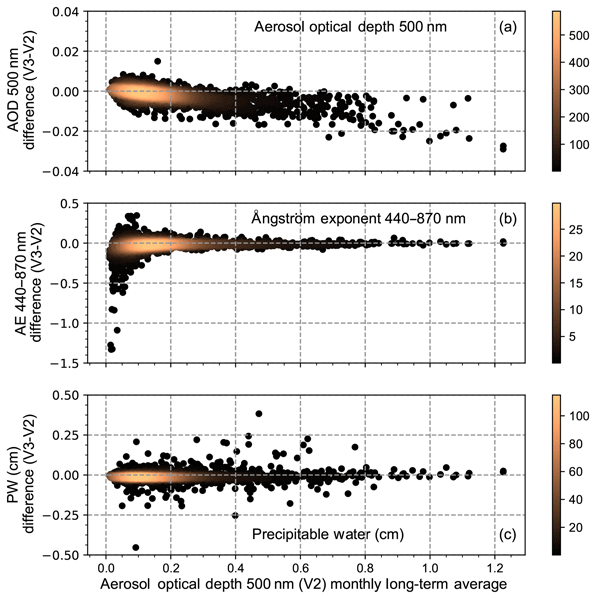 The lidar ratios characterizing each type have been updated and the effects of these changes on CALIPSO retrievals of aerosol optical depth are examined in detail. We introduce a new global satellite product of aerosol amounts lofted above the clouds from near-UV observations of Aura/OMI. The global decadal record derived from the product has revealed unprecedented quantitative information of light-absorbing aerosols above the cloud over several oceanic and continental regions of the world. The new dataset characterizing the optical properties of aerosol-cloud overlap will help quantify their radiative effects and representation in climate models. A new snow/snowmelt screening approach – combining a normalized difference snow index (NDSI)- and brightness temperature (BT)-based snow test, snow adjacency test and spatial filter – is proposed to significantly reduce the snow/snowmelt contamination in the NOAA’s operational Visible Infrared Imaging Radiometer Suite (VIIRS) aerosol optical depth (AOD) product, particularly over Northern Hemisphere high-latitude regions during spring thaw. MAIAC algorithm used for the MODIS C6 processing is described. MAIAC combines time series analysis and pixel/image-based processing to improve the accuracy of cloud detection, aerosol retrievals and atmospheric correction. MAIAC offers an interdisciplinary suite of atmospheric, land surface and snow products. Due to generally high quality, high resolution and high coverage, MAIAC AOD and surface reflectance/BRDF have been widely used for air quality and land research and applications. Near-UV AAI is a qualitative parameter detecting the elevated absorbing aerosol layer. 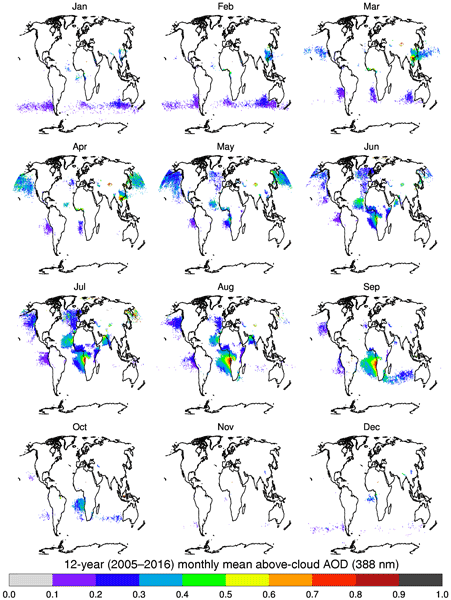 A long-term AAI record of satellite observations has the potential to quantify aerosol absorption on a global scale. Our study presents the possibility of retrieving single-scattering albedo with OMI-measured AAI. The comparison with AERONET is satisfactory and further research will be on how the aerosol wavelength-dependent refractive index and aerosol profile affect the quantification of aerosol absorption. The high potential of the MPLNET polarized Micro-Pulse LiDAR (P-MPL) is demonstrated in synergy with the POLIPHON (POlarization-LIdar PHOtometer Networking) method to retrieve the vertical separation of both the optical and mass features of the dust, smoke and pollen components mixed with other aerosols. This synergetic procedure can be easily applied to the worldwide MPLNET lidar systems and to space-borne lidars: the ongoing NASA CALIPSO/CALIOP and the forthcoming ESA EarthCARE/ATLID. The CALIPSO level 3 aerosol profile product reports globally gridded, quality-screened monthly mean aerosol extinction profiles retrieved by the spaceborne lidar, CALIOP. This paper describes the quality screening and averaging methods used to generate the product. Impacts of quality screening on reported quantities are evaluated, in particular the change in aerosol extinction profiles and aerosol optical depth. 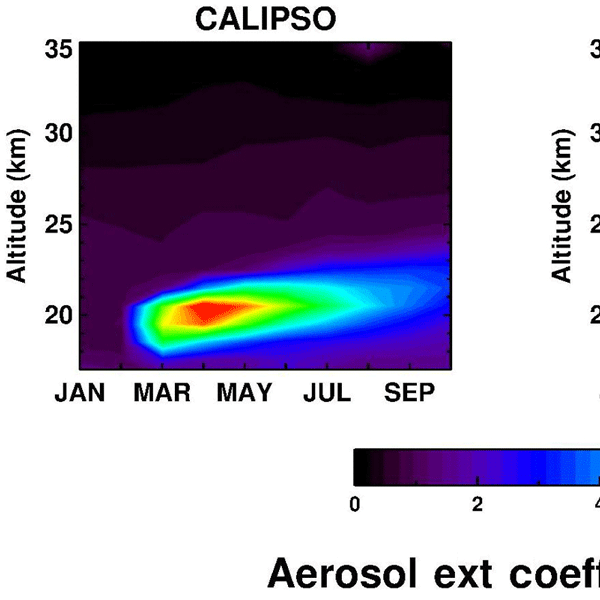 The paper thereby provides guidance on the use of CALIOP aerosol data. An approach to estimate the height of aerosol plumes over land from satellite measurements of the oxygen A band is proposed. The method, termed dynamic scaling, forces the retrieval to use spectral points that contain more height information. The method is tested in a synthetic environment as well as with GOME-2A and GOME-2B measurements of wildfire plumes over Europe, with very encouraging results. This method can be easily applied to other aerosol height algorithms using least squares. Satellite-measured radiance from an Earth scene comprises light scattered and absorbed by gases, clouds and aerosols in the atmosphere and by the Earth surface. To retrieve aerosol information, the signal from clouds, gases and the surface must be separated from the aerosol signal. This paper highlights the gas absorption correction method used by the MODIS dark-target aerosol retrieval algorithm and demonstrates that aerosol retrieval accuracy depends on accurate gas absorption correction. Vertical profiles of the aerosol physical and optical properties, with a focus on seasonal means and on transport events, were investigated by the synergistic method using lidar and sky radiometer. The retrieved vertical profiles were input to the one-dimensional atmospheric model, and the impacts of the transported aerosols on the evolution of the atmospheric boundary layer (ABL) were studied. The vertical profile of the aerosol direct heating has important effects on the ABL evolution. Since about three years after the launch the Ozone Monitoring Instrument (OMI) on the EOS-Aura satellite, the sensor’s viewing capability has been affected by what is believed to be an internal obstruction that has reduced OMI’s spatial coverage. It currently affects about half of the instrument’s 60 viewing positions. 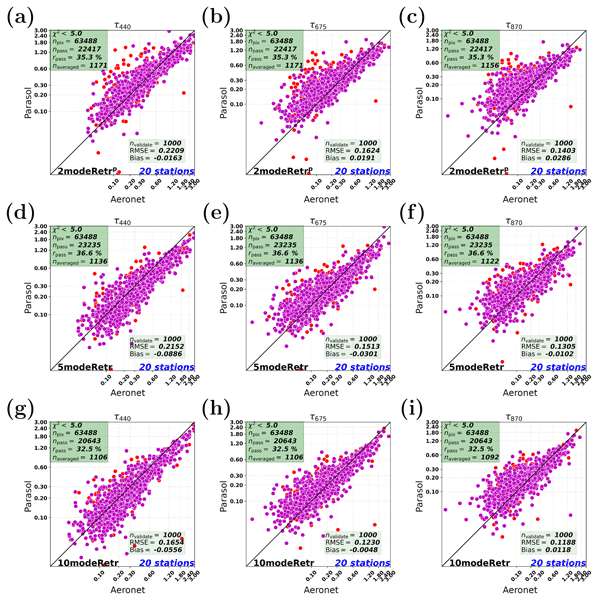 In this work we carry out an analysis to assess the effect of the reduced spatial coverage on the monthly average values of retrieved parameters. The Ozone Mapping and Profiler Suite (OMPS) Limb Profiler (LP) Version 1 algorithm retrieves aerosol extinction profiles at 675 nm by iteration, based on comparisons between the measured and calculated radiance profiles (assuming an aerosol size distribution). The most significant error source is uncertainty about the aerosol phase function. 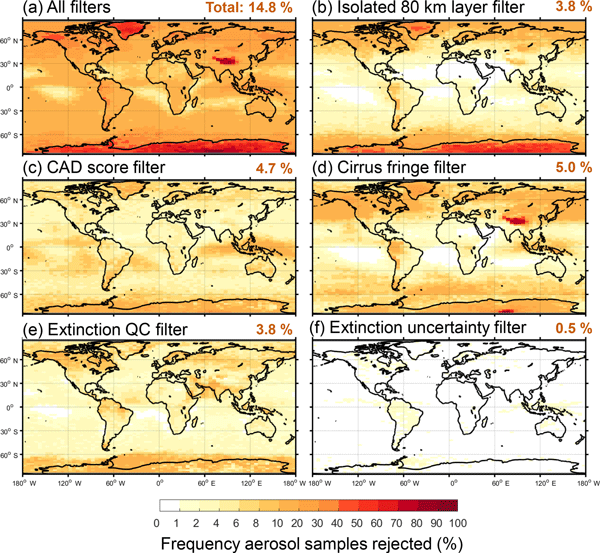 Horizontal variations in aerosol extinction may also limit the quality of the retrieved aerosol extinction profiles. Stratospheric aerosols play an important role in climate change. 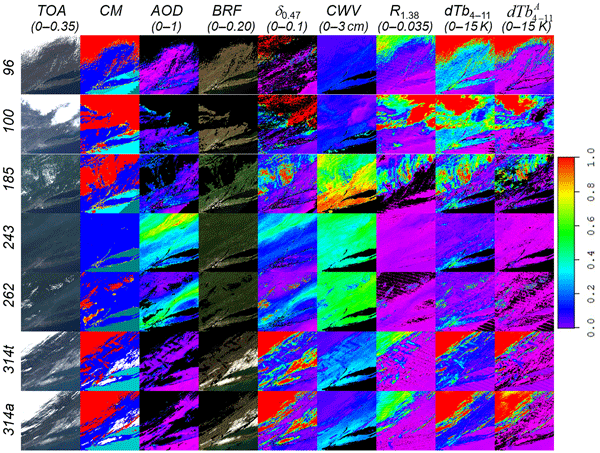 This paper presents the retrieval algorithm of two aerosol particle size distribution parameters in the stratosphere from remote sensing instruments. A unique data set was created by implementing this algorithm on SCIAMACHY limb measurements. 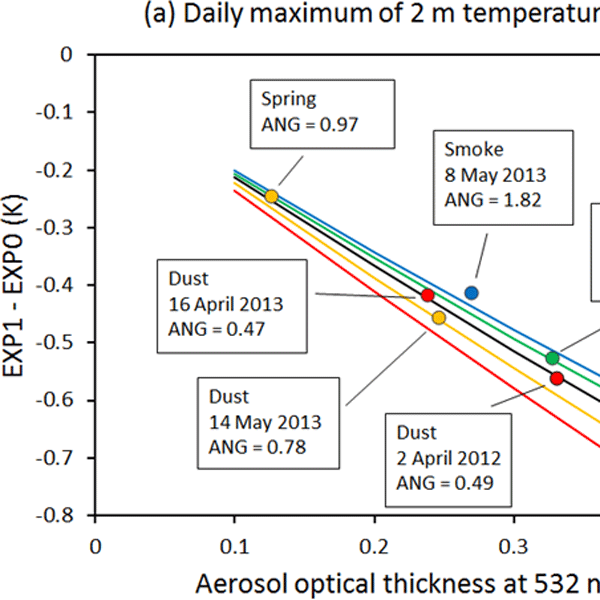 The general behaviour of the aerosol particle size parameters was revealed. Comparison of the retrieved parameters with another instrument showed good agreement. We evaluate the comparability of aerosol and cloud vertically resolved optical properties obtained with varying lidar profiling techniques and/or data processing methodologies. The discrepancies are assessed by evaluating climate-sensitive direct radiative effects, computed by radiative transfer code means. 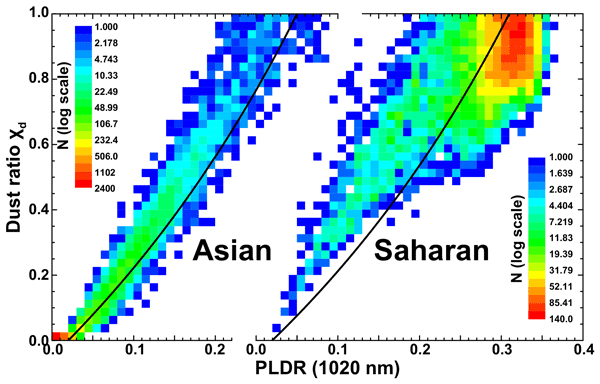 Results show important discrepancies up to 0.8 W m−2 due to lidar data smoothing in cirrus clouds and a 0.05 W m−2 difference between Raman and elastic lidar technique on a dust layer aloft. We present the motivation for and the implementation of the version 4.1 nighttime 532 nm parallel-channel calibration of the CALIOP lidar. The accuracy of calibration is significantly improved by raising the molecular normalization altitude from 30–34 km to 36–39 km to substantially reduce stratospheric aerosol contamination. The new calibration procedure eliminates biases in earlier versions and leads to an improved representation of stratospheric aerosols. 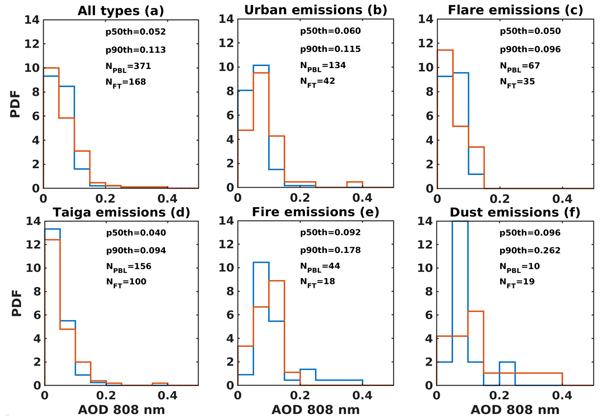 This study outlines a new methodology for assessing air pollution from space using observations from Multi-angle Imaging SpectroRadiometer (MISR). 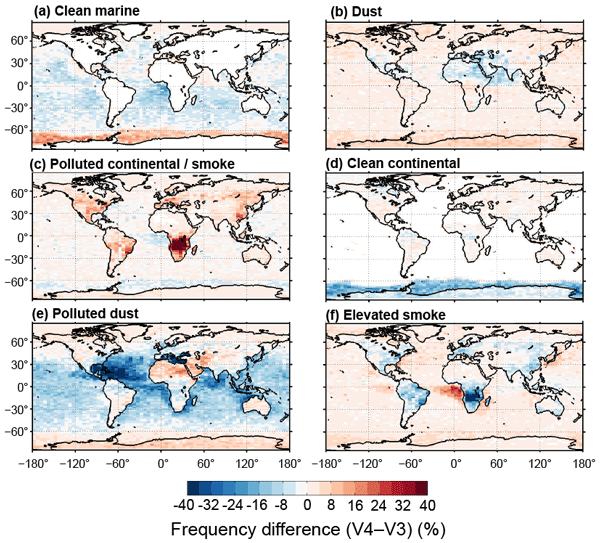 Both air pollution amounts – as well as the uncertainties associated with space observations – are simultaneously and consistently obtained from MISR measurements over oceans. The new products have superior quality to the previous versions and will benefit the air pollution community. 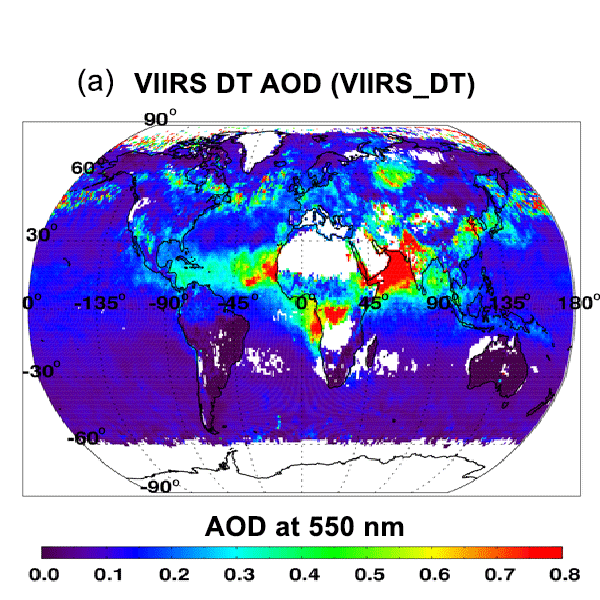 This study is a major version upgrade of the aerosol product from GOCI, the first and unique ocean color imager in geostationary earth orbit. It describes the improvement of version 2 of the GOCI Yonsei aerosol retrieval algorithm for near-real-time processing with improved accuracy from the modification of cloud masking, surface reflectance, etc. The product is validated against AERONET/SONET over East Asia with analyses of various errors features, and a pixel-level uncertainty is calculated. Estimating aerosol layer height in the atmosphere from satellite data in the oxygen A band (758–770 nm) over land is challenging over land, since the surface is generally very bright in this wavelength region. 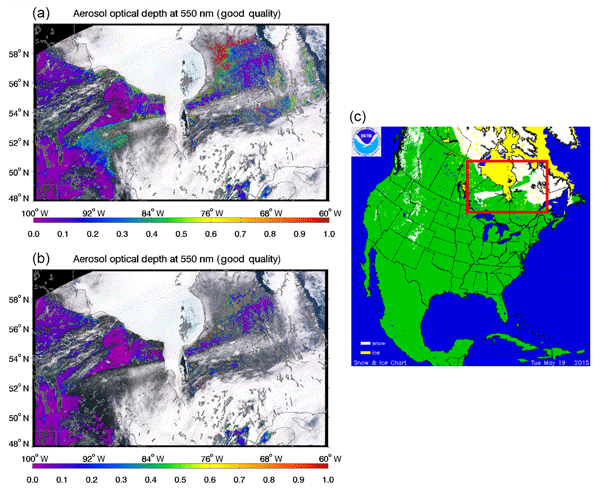 This paper discusses an interplay between the surface and the atmosphere in their contributions to the top-of-atmosphere reflectance spectrum and the consequent biases obtained while estimating aerosol layer height, using synthetic data and real data from the GOME-2 satellite instrument. In this paper an algorithm for the retrieval of aerosol properties from NASA Research Scanning Polarimeter (RSP) data is presented. An artificial neural network is used to produce a first estimate of the aerosol properties, which is then improved using an iterative retrieval scheme based on Phillips–Tikhonov regularization. Using the neural network retrievals as a first guess for the Phillips–Tikhonov improved the retrieval convergence, confirming results previously found on ground-based data. We need satellite observations to characterize the properties of atmospheric aerosols. Those observations have uncertainties associated with them because of assumptions made in their algorithms. We test the assumptions on a part of the aerosol algorithms used with the Ozone Monitoring Instrument (OMI) flying on the NASA Aura spacecraft. We simulate the OMI observations using a global aerosol model, and then compare what OMI tells us about the simulated aerosols with the model results directly. A novel technique for multiwavelength lidars is introduced to derive information on the particle type in the tropospheric profile in analogy to the Cloudnet target classification. Four different aerosol classes and several cloud classes are defined. The technique is based on absolute calibrated lidar signals in temporally high resolution and thus is also well suited for aerosol–cloud-interaction studies. The approach was applied on a 2-month data set of the HOPE campaign in western Germany. This work involves a first analysis of the systematic errors observed in the AOD retrieved at nighttime using the Sun–sky–lunar CE318-T photometer. In this respect, this paper is a first attempt to correct the AOD uncertainties that currently affect the lunar photometry by means of an empirical regression model. We have detected and corrected an important bias correlated to the Moon's phase and zenith angles, especially at longer wavelength channels. Monitoring fine aerosol concentration is important because of the adverse impacts of high fine-particle concentration on human health. However, monitoring fine aerosols is difficult during cloudy and nighttime periods. In this study, an empirical model using measurements from ceilometers was developed to measure fine aerosol mass concentration even under cloudy or nighttime conditions. The findings of this study illustrate the strong need for ceilometer data in air quality monitoring. Aerosol amount and type affect the “atmospheric correction” needed to derive ocean surface chlorophyll a concentration (Chl) from satellite remote sensing and, conversely, the ocean surface representation affects aerosol retrieval products. 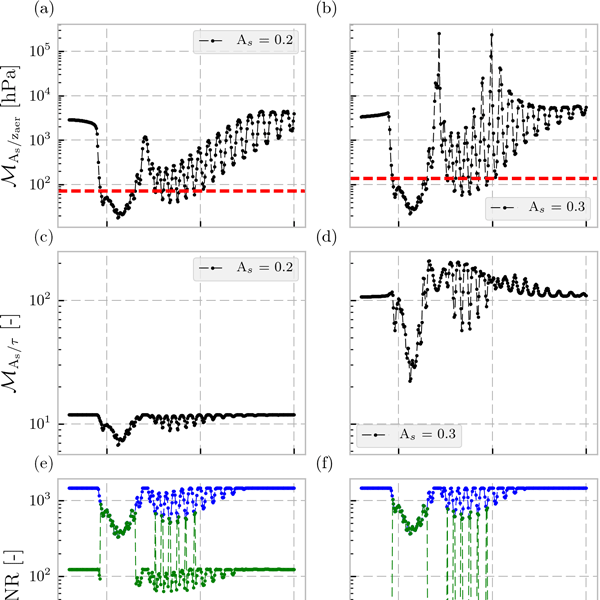 We introduce a coupled atmosphere-surface retrieval for Multi-angle Imaging SpectroRadiometer observations over dark water aimed at improving both aerosol and Chl results. We also refine the MISR calibration, critical to achieving high-quality retrievals. 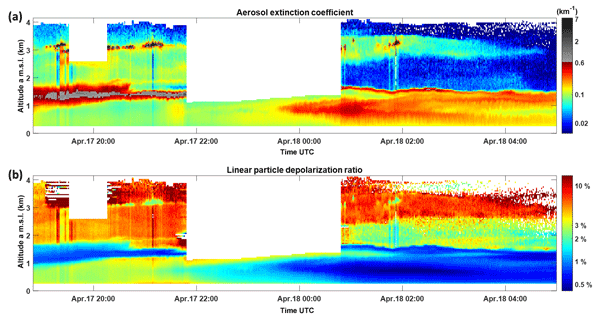 We have developed artificial neural network algorithms to retrieve aerosol layer height from satellite OMI observations of the 477 nm O2–O2 spectral band. 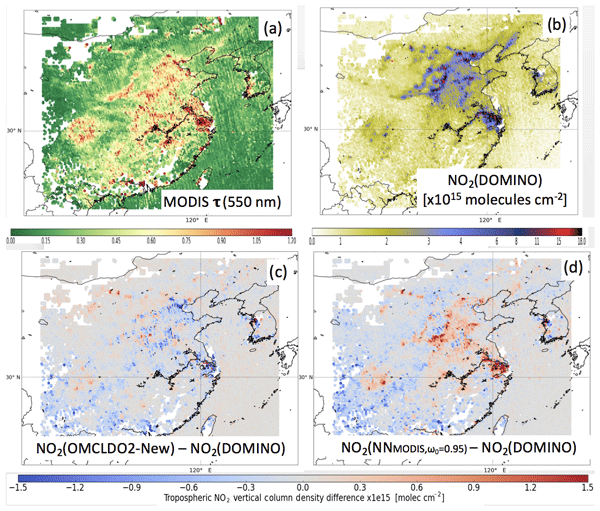 Based on 3-year (2005–2007) cloud-free scenes over north-east Asia, the results show uncertainties of 260–800 m when aerosol optical thickness is larger than 1. These algorithms also enable aerosol optical thickness retrievals by exploring the OMI continuum reflectance. These results may be used for future trace gas retrievals from TROPOMI. Clouds reflect solar light much more strongly than aerosol particles. Therefore, the retrieval of aerosol optical depth is usually only attempted over cloud-free areas. A very strict cloud detection scheme has to be applied to remove all cloudy pixels. However, often not all clouds are detected. To remove possibly cloud-contaminated pixels, a cloud post-processing algorithm has been designed, which effectively solves the problem and results in smoother AOD maps and improved validation results. Aerosol properties were studied during a mega-fire event in summer 2012 over Siberia using ground-based measurements of spectral solar radiation at the AERONET site in Tomsk and satellite observations. The data were analysed using multi-year measurements under background conditions and yearly observed wildfires. 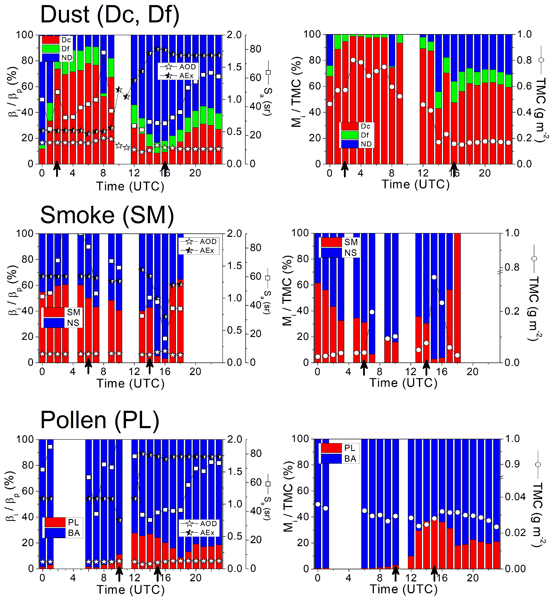 It is shown that the aerosol radiation characteristics during individual severe fires differ significantly from the ensemble smoke hazes which are typical for the Siberian region.